Probably the ultimate in the original Sabre family, the FJ-4 had almost nothing in common with the original F-86. You may recall that the FJ-1 Fury, a straight winged aircraft that eventually became the F-86 Sabre, was designed for the US Navy and saw limited use. This was followed by navalized F-86E/F versions that were armed with four 20mm cannon in place of the USAF's 6 .50 cal maching guns. They also had different canopies and landing gear to handle the stresses of carrier operations. Add to it folding wings and an arrestor hook and you had the FJ-2 and FJ-3 aircraft. Furies were developed as fighter bombers and not interceptors, so it was important that they be able to carry a decent ordnance load. This included air to ground missiles; Bullpups, to be exact. They also had Sidewinders for self defense and had to be able to haul one of the latest nuclear weapons. These were not at all light and the FJ-2/3 had difficulty with them. The FJ-4, like the F-86H, was a re-engined aircraft with the J-65 and with a number of other airframe improvements resulted in basically a brand new aircraft. Funding being what it was it, like the F-18E/F of today, was passed off as a development of the earlier types. Thanks to the new engine, the FJ-4 could carry a prodigious weapons load of up to six Bullpups, though that would have been infrequently done as it drastically reduced range. More normal was a pair of Sidewinders, a pair of drop tanks and a pair of Bullpups. The aircraft gave good service until replaced by more modern types including the F-8 and F-4 in the early 1960s. Enough FJ-4s were still around in 1962 to be redesignated F-1Es. 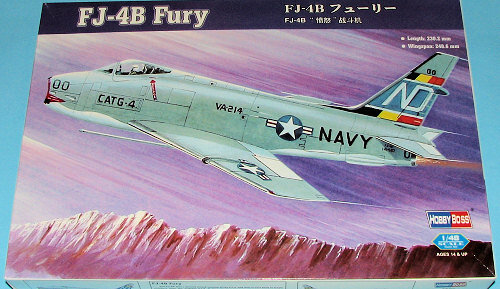 This is the third 1/48 FJ-4 to be produced. First was the Matchbox kit which had a pretty good shape, but was otherwise a very basic kit with little detail. Then Grand Phoenix had MPM produce their multi-media kit. Hailed as 'just what we wanted', the kit was not exactly the easiest kit to put together, something pretty typical of the short run kits of the day. Now we have one from Hobby Boss and I have to say that this one combines what looks like the ease of construction of the Matchbox kit with the detail of the Grand Phoenix version. It has engraved panel lines and somewhat subdued rivet and screw detail. 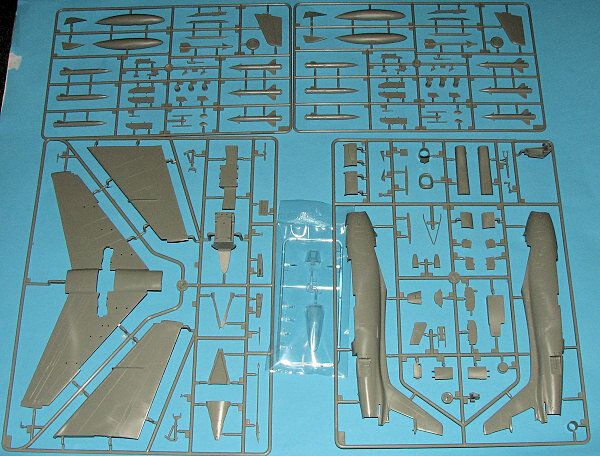 In fact, I'm reminded of current Hasegawa 1/48 jet kits when looking at the sprues. I had to really search to find any mold glitches. There are sink areas on the seat cushion and I found the nose radome piece to be a bit flat. There is a two piece intake that has a seam which will be difficult to fill properly. The cockpit is most complete with a reasonably well done bang seat sans harness. The lower wing is one piece with two upper wing sections. Wings can be built folded if you are willing to cut the tips to do so. An insert is provided in that case. The two outer pylon holes are already opened and one has to open the inner ones if one wants to have that pylon installed. The speed brakes can be posed open, but were usually closed or nearly so when on the ground. The arrestor hook well has two optional bits. One for the hook up and one for it deployed. If you forget to install nose weight (which isn't mentioned in the instructions), you may want the hook down to hold up the plane. For things under wings you get six Bullpups, two Sidewinders and two drop tanks to mix and match as you would. The canopy and windscreen are separate so you can pose the canopy open if you wish to. Instructions are well done with nicely drawn construction steps. Color information is on the painting and markings sheet. This is in full color and references Gunze paints. Both options are in light gull grey over white. The upper grey is matte while the white is gloss. 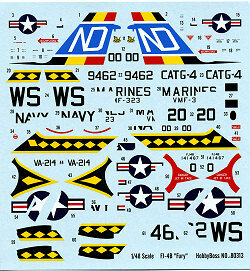 Those of us who have built FJ-4s in other scales or from other companies will recognize the markings. First is the CAG bird from VA-214 in 1958, while the other is from VMF-323, also in 1958. The decal sheet is very well printed and my experience with Hobby Boss decals when building the MiG-3 was quite positive. There are also aftermarket decals for the Grand Phoenix kit that should fit this one as well. I'd have to say that Hobby Boss has another winner on their hands with this kit. Though I'm sure the experts will come crawling out of the woodwork to find fault with it, I and many others will be very pleased with what is in the box on this one. My thanks to www.hlj.com for the preview kit. Get yours at Japanese prices.